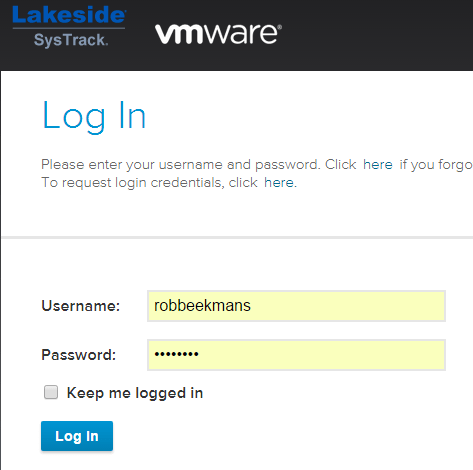 Systrack assessments by VMware – part 1. This blog will show you in two posts how you setup the environment and what it is monitoring. It’s a two set blog because you only get data after three days of monitoring, still not there and I didn’t want to keep this news from you. It’s really simple, it’s a cloud based solution where you access the dashboard through a URL. The client sending the data is running on the local computers and will send data on a regular bases. The client you download from your dashboard is configured to talk to that dashboard so there is 0 configuration… ain’t that sweet. Once you’re there either create an account or logon with a existing one.. The first time you logon you will see information about what to do to get started. 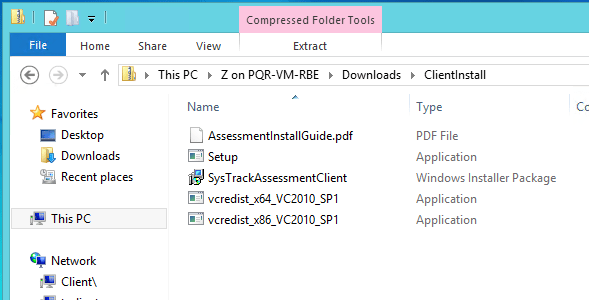 Open the PDF and read it (yeah right,…) download the client. There is nothing to see or do here if you haven’t got a client running for a couple of days, no nice pictures no nothing. Move on. Once the client is downloaded you unzip the package and Start Setup.exe with Administrative rights. If you don’t it will error out telling you to do just that. If you did read the PDF you found this little line of text, it says you have to wait at least three days to get some data and at least two weeks to get proper data. I don’t know about you guys but I clicked F5 a million times already just now for three days is like for ever and two weeks…. After the installation is done, we notice a process called LSI User Application in the task manager. If you look in the log you see if the installation is working fine. Of course like you will also do, I checked the dashboard… where is the data, why isn’t there some yet. I’m used to work with eG Innovations and data flows in pretty fast there… so I went on a local search, somewhere someone has my data. In the Program files(x86)SystrackUtilities folder is a LSIClientTrayApp.exe found. Perhaps I shouldn’t start it, perhaps I mess up something, nowhere does it say I should start it… ah no guts no glory. When you right click on the tray app you have the ability to choose Diagnostics. When you do that a webpage is opened and you can see the result of the monitoring. 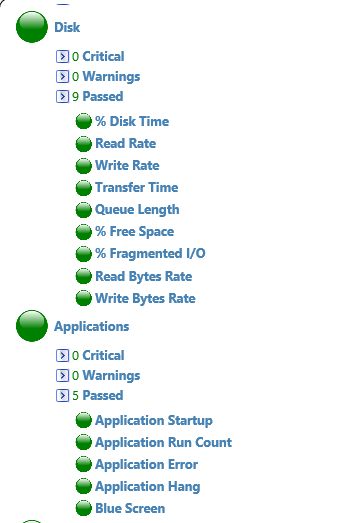 I seems my VM running on a MAC book had initial issues reaching the gateway. trying later on didn’t give more errors so it looks fine. 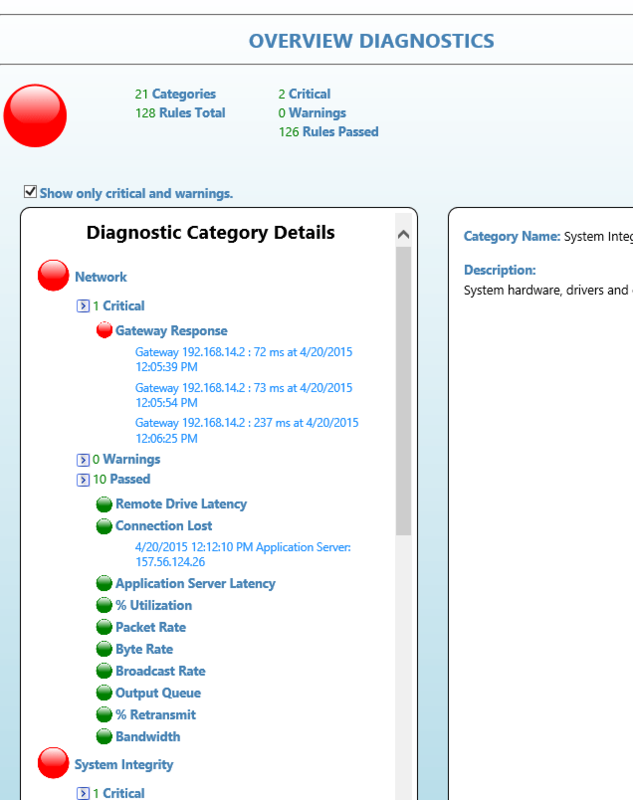 To give you an idea of what it is monitoring here is picture of some details, not all of them but you get the picture. So it looks like it monitoring and collecting data, there is no data found in the dashboard. Looks like I have to wait for a while to get that data. That’s a small thing I think that could be improved, a hello I’m there signal should be sent and displayed from the dashboard like a number of computers registered. I looked around in the folder of Systrack and found the tool logviewer, which give you the log but from the viewer. Also I found another log called LSIWebcom.log which shows whether there is data sent to the cloud. It shows me that there is not enough data yet (the maximum has not been reached) and therefor it’s reporting data to the SDA which I presume is the load database they got running to capture the data. In my next blog I’ll show you the dashboard and what you can do with the data, for now,, install the agent and analyze that data. 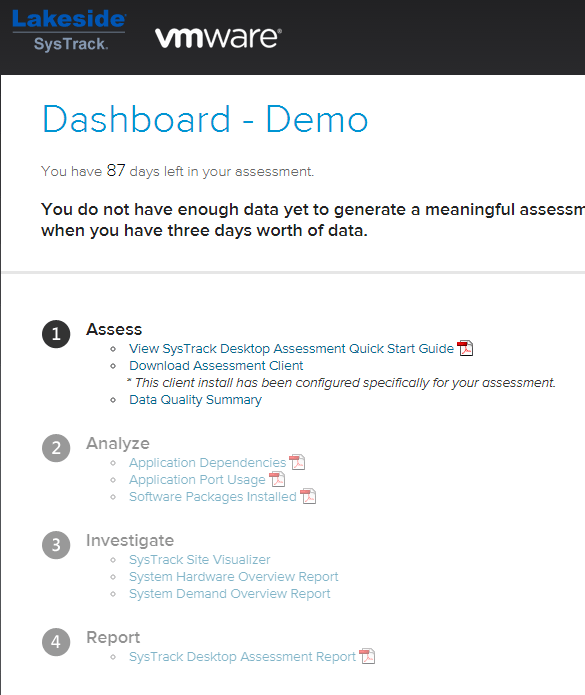 Systrack assessments by VMware – part 2.